David Kersey, Ph.D., began his career in wildlife conservation in 2000 working as an endocrine technician at the Smithsonian Conservation Biology Institute (SCBI). In 2008 he earned his Ph.D. in Environmental Science from George Mason University. 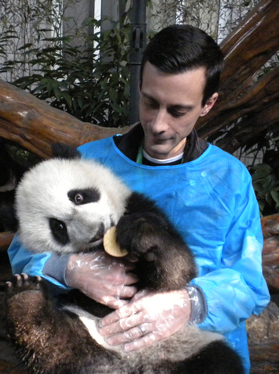 For his dissertation, he conducted research at SCBI in collaboration with Chinese colleagues to study the reproductive and adrenal biology of the male and female giant panda. During this time, Dr. Kersey refined pervious ideas of reproductive physiology and worked towards improving breeding and management of the species in captivity. 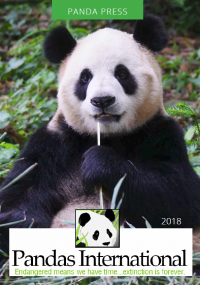 He has authored and coauthored a number of research articles that address different aspects of endocrinology and reproduction in the giant panda. Among his many accomplishments is a refinement of when natural breeding and/or artificial insemination should be done based on urinary hormone levels. Most notably, Dr. Kersey trained Chinese colleagues at some the major breeding facilities in China in the hormone monitoring techniques he helped refine and develop, and set up a hormone lab at the Chengdu Research Base of Panda Breeding, which has since seen an increase in the number of cubs produced due to improved timing of breeding and insemination. Additionally, his expertise is sought in the US and abroad in consultation with giant panda breeding. 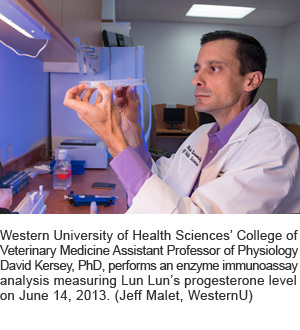 Currently, Dr. Kersey is an Assistant Professor of Physiology at Western University of Health Sciences in the College of Veterinary Medicine, where he is Course Leader of Veterinary Basic Sciences, and member of the physiology content expert team. 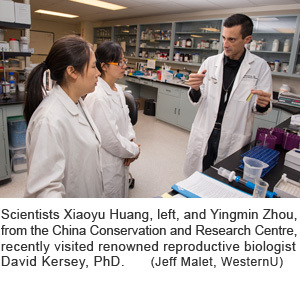 Dr. Kersey continues to work with colleagues in the US and China on giant panda reproduction in an effort to improve conservation efforts for the species.